Online travel agencies (OTAs) such as Expedia and Priceline as well as meta-search engines like Kayak and Google Hotel Finder have become crucial to many hotels’ overall advertising mix – especially during low booking seasons or to fill rooms at the last minute. But property owners should be careful not to neglect other hotel marketing strategies and let these channels consume too large a percentage of their revenue. Rate parity clauses in agreements with OTAs make it difficult for hotels to convince customers that they can find a better deal elsewhere, as they prevent hotels from advertising lower rates on their direct website. But there are still methods hotels can use to drive more direct bookings and avoid expensive OTA commissions. My company recently interviewed experts at some of the top hotel management technology and marketing companies to get their thoughts on the subject. They shared five hotel marketing strategies hotels can use to ensure they keep a diverse revenue portfolio. Your blog is a great avenue for both reminding potential customers why that moment is a great time to travel and for pitching them on deals relevant to whatever seasonal event might be happening. You can send these articles to your email marketing list, as well as optimize them with keywords that have high search traffic. This latter strategy can drive more organic traffic to your website. For example, “SXSW hotels” receives 170 searches per month, so Austin-area hotels could write blogs optimized for these keywords so they rank relevantly when people search for that term in Google. 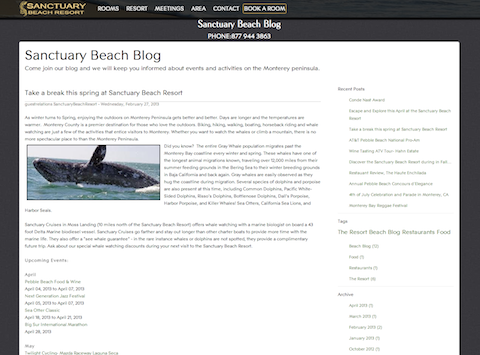 Here’s an example of a blog post advertising springtime events in the area around The Sanctuary Beach Resort in Monterey Bay. Often, travelers shopping on OTAs visit the hotel’s website to learn more about the accommodations offered. Smart web design can ensure that you capture those site visitors and get them to book direct. First off, make it as easy as possible to book. Provide “book now” buttons on every page that link to your hotel booking system. These buttons should be located near the top of the page so they are clearly visible. Also, since many customers assume they will get less desirable rooms if they book through an OTA, ensure that you showcase your best rooms with high-resolution imagery on your website. 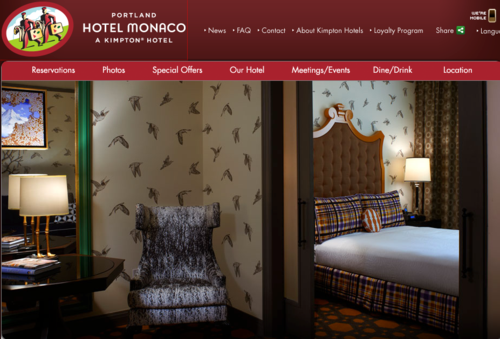 Here’s a great example from the Hotel Monaco, a Revinate customer, in Portland. Their big selling point is the unique room design. When customers use OTAs, they often get a list of five or so properties in a similar price range. In addition to visiting the hotel websites, they will also read online reviews. Online reviews present another opportunity to draw customers to your own site, rather than having them return to the OTA to book. When customers post reviews about your hotel, you need to try your best to answer as many as possible, whether they’re positive or negative. Revinate’s Reputation solution makes monitoring these reviews as easy as checking emails. The system scours all hotel review sites and collects every mention of your hotel in one location. Revinate also lets you respond directly to reviewers without ever leaving its interface, cutting down time spent hopping from one review site to another. Besides just viewing and responding to comments, the tool gives you a deeper understanding of your customers with its sentiment analysis. You can see exactly what’s working and what’s not at your hotel, pinpoint trends among customers, and even learn how your hotel stacks up compared to your competitors. In most cases, OTA rate parity agreements only apply to rates you advertise to an open audience – for example, all visitors to your website. These requirements do not, however, apply to offers distributed to a very gated, limited audience. For example, you could provide a special offer to your loyal Facebook followers with savings greater than what they can find anywhere else. You can also send deals to an email or direct mailing list of customers that signed up for your loyalty program. Don’t limit yourself to discounting either. You can offer gift cards, tickets to a local event or coupons for a discounted meal in your hotel restaurant. Packaging services and other perks is another great way to offer discounts to customers while still following rate parity agreements. The price for the package might be greater than the OTA offer, but the extra perks make your deal more worthwhile and result in a larger overall savings. Some ideas for add-ons include free wifi, parking, breakfast and event tickets. For example, a ski resort could offer the room at the regular full price but include a free pair of lift tickets. The opportunities here are endless and will vary by your market. How do you increase direct bookings? Let us know below! HELP US TO GENERATE MORE BUSINESS AND INCREASE OUR ROOM REVENUE . The five best practice which are us=mentioned in this blog is good. Keep sharing. Nice blog and much needed as OTAs do charge a lot. We are new resort in knap u r karat aka India and want to increase my resort business. Points given in the post are so useful. I will always keep it in my mind. I echo the same point, the opportunities are endless. Really nice, at least have gotten some ideas to drive sales to my clients business as a social media agency. Thank you.